The “Ceremony of Completion of the Sea Section of the TurkStream ” was held with the speeches of Turkish President Recep Tayyip Erdoğan and Russian President Vladimir Putin at the Istanbul Convention Center. Erdogan pointed out that the construction of the plant in the coastal area of the pipeline is continuing and he said TurkStream will be ready after the tests in 2019. Erdogan said that half of the gas coming from the line will be forwarded to Europe. As Mr. Erdogan said, “Bursa, Kocaeli, Izmir, Istanbul will occur as new supply regions. Turkey will meet its natural gas demands as well as Europe’s by avoiding the transit risks. Erdogan pointed out that the trade between the two countries increased and said “Our goal is to reach a trade volume of 100 billion dollars. In the first 9 months of tourism, we have signed a new record with 5.1 million Russian tourists. In 2019, we will celebrate bilaterally as the Year of Culture and Tourism. Events will be instrumental in our peoples to know each other well, “he said. Both President Erdoğan and Russian President Putin’s speech at the ceremony received great applause. Both leaders mentioned Turkish Russian friendship. 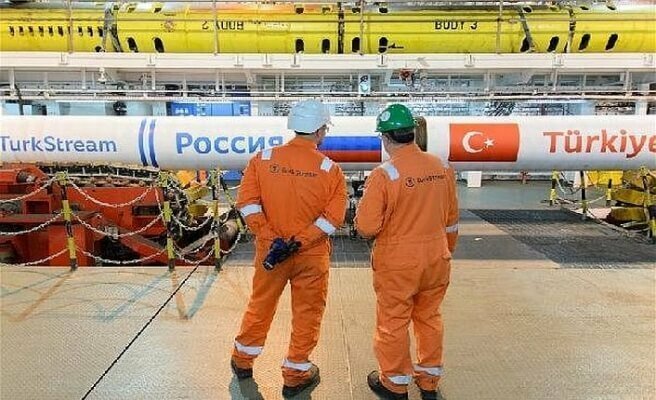 – The TurkStream project which will carry 31.5 billion cubic meters of natural gas from Russia to Turkey and Europe, was laid 4 years ago. According to the agreements between the two country the construction began on May 2015. – The pipes in which the TurkStream gas pass were produced in Germany, Japan and Russia. The manufactured pipes were stored in Bulgaria’s Varna and Burgas and Turkey’s Samsun and Trabzon ports. – Up to 400 pipes were transferred from these ports to the ship every day. An average of 5 kilometers of pipes were laid daily. The ship made a world record by piping 6.3 kilometers of pipe in one day..
– On June 23, 2017, construction started in deep water. On November 4, 2017, lines entered to Turkey exclusive economic zone. The first line was completed on April 30, 2018. On June 26, 2018, the construction of the second line started again. Today the construction of the sea line of the second line ends. – TürkAkım is the widest (81 cm in diameter) pipeline laid at a depth of 2 thousand 200 meters. The project included 158 thousand pipes, each measuring 12 meters and weighing 9 tons. – The total weight of the Pioneering Spirit ship in the construction of the line is eight times the size of the famous Titanic. (403342 gross ton). The deck of the ship is the size of 6 football fields. The "Ceremony of Completion of the Sea Section of the TurkStream " was held with the speeches of Turkish President Recep Tayyip Erdoğan and Russian President Vladimir Putin at the Istanbul Convention Center.